Thanks to Youth Radio, the Alaska Humanities Forum, and Arctic Entries for helping Rion’s story reach a wider audience! Listen to Rion’s story here and/or read about her experience telling it, below. Story Works Alaska supports youth voices by encouraging and supporting student storytellers. Its workshops bring volunteer storytelling coaches from a variety of professions into high school classrooms to help teenagers develop reflective, first-person accounts. Some workshop participants go on to tell their stories at live storytelling events such as Arctic Entries, or in broadcast media pieces at the Alaska Teen Media Institute radio show, “In Other News” on KNBA. Both Story Works and ATMI have been supported by Alaska Humanities Forum grants. Story Works Alaska just won a 2016 “Contributions to Literacy in Alaska” award from the Alaska Center for the Book. In February, then-sophomore Rion Iverson told a story at Arctic Entries that she created as part of a Story Works event at West High School. Rion kindly shared the following essay about her Story Works and Arctic Entries experiences. Part of me was definitely apprehensive about announcing that I’m a lesbian to my entire English class. While I was never actually closeted and was already out to most of the class, there were a few people whom I didn’t know that well and I was unsure of how they would react. There’s something decidedly different about being out to everybody as individuals, and being out to everybody as a group. This whole thing started with a project in my English class called Story Works Alaska. The criteria were as follows: We had to write a story about a major event in our lives. The story had to be true, it had to be less than seven minutes in length, and we had to show how it affected our life. After it was written, we had to present it for the class. When it was first announced that we had a three-week storytelling project, I wasn’t exactly thrilled, but once it was further explained, my excitement began to grow. This wasn’t an analytical essay on The Iliad; I would get to talk about myself. I love talking about myself. The first step was figuring out what to write about. The obvious choice was to write about the murder of my uncle, which taught me that it’s important to let people know how you feel about them before it’s too late. While this is one of the most important lessons I’ve learned in life, I’ve written about that for every English class I’ve had since the fifth grade. Not only did I want to write about something new, for a change, but I wanted to write about something less upsetting. This decision led me to the topic I ultimately chose: how Beetlejuice, a classic Tim Burton film from the 80s, made me gay. One of the things that made this project so great was that the story was not supposed to be performed word for word. It was supposed to be told casually, as though you were telling a story to a group of friends. In fact, we didn’t even have to turn in the written speech (my story notes are pretty much entirely in text speak). That removed a lot of pressure; but there was still the discomfort of coming out to my whole class. Anyways, I performed my story, and of course, all of my apprehensions were nullified. I had fun, my classmates were receptive, and it was, for lack of better phrasing, super chill. I ended up getting a perfect score on the assignment, but that’s not where this story ends. There was going to be a show in the auditorium at school one night where nine students would perform their stories in front of an audience. I decided to do it. 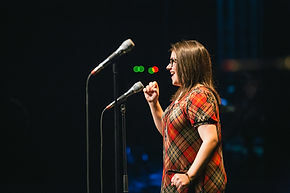 The school auditorium show led to an opportunity to share my story at the community-wide storytelling event, Arctic Entries, in front of 750 people. I was definitely nervous, but I rose to the challenge. Since performing my story at Arctic Entries, I’ve been approached by many people who attended the show as well as those who heard it on the radio, and it’s just overall been a really cool experience. So far I’ve not received any negative feedback, but I understand that putting my story out into the world could elicit that. Having never experienced homophobia, I don’t know how I’d respond. What I do know is that I want to reach other LGBT+ kids who aren’t used to hearing about other people like them. And I want to tell them it’s OK to wear any label they choose. Story Works student storytellers from Anchorage’s West and Dimond High Schools have been featured on the Alaska Teen Media Institute’s youth radio show, In Other News! Listen to these students share their stories here. Everyone has a story to tell, but it may not be the story you’d expect. An Anchorage non-profit called StoryWorks is helping teenagers find their stories, and this summer they focused on students who arrived in the state as refugees. A group of students and their story-telling mentor lounge on couches at UAA telling each other about their lives. “Did you learn something from that day?” Rosey Robards asks 17-year-old Furaha Sefania. “Wakati nilikuwa nacheza mpira na rafiki zangu, na mdogo…” Sefania tells her story. She’s talking about a time when she was 12 years old and playing soccer with her friends back in Mozambique. Her little sister calls her to come eat and she refuses to go. When she finally heads home two hours later, the food is gone. Her sister laughs because she received extra, and her mother admonishes her – if you like soccer so much, than you can eat it! Sefania says she learned to listen to her mother. So why tell this story? “Niliona tu, tuongee.” She just thought of it when chatting. And that’s the whole point – stories are just moments to help people understand each other. That’s why 11-year-old Khalil Edais participated in the program. He was born in Anchorage but he loves storytelling and wanted to learn about the other kids. Edais learned about a girl who climbed a tree, was distracted by a monkey, and ended up at the hospital getting shards of wood pulled from her arm. A boy told about the disappointment of leaving home for a cold place but eventually making new friends. Jessica Kovarik, the program director of Refugee Assistance and Immigration Services, says these stories can help the community understand people from other nations. Twelve-year-old Iqlas Dubed shares the story of her first bee sting – just a month ago, near the Campbell Creek Science Center. She said she feels kind of brave now. RAIS helps resettle about 100 to 140 refugees in Anchorage each year. StoryWorks started in 2014 and teaches high schoolers from around the community to find their voices. Interested in donating to support our work? Thank you, we’d love that! Donations to Story Works Alaska are used to support our growing program. All donations are processed by our fiscal sponsor, Content Producers Guild (501(c)(3), tax ID: 27-2591916), and are tax deductible.